Photograph of Eden Gardens in Calcutta, from an album of 62 views of India and Ceylon. The print is unsigned but probably by Johnston & Hoffmann. Eden Gardens was named after Emily and Fanny Eden, the sisters of Lord Auckland, Governor-General of India from 1836-1842. 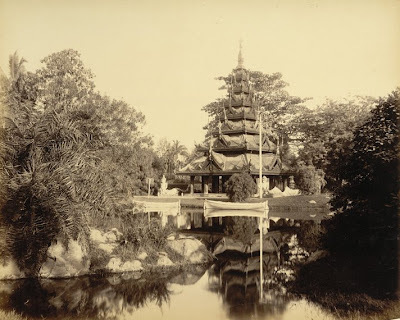 This view looks across the lake towards the Burmese Pagoda erected in 1856 and brought to Calcutta from Prome, in Burma, by Lord Dalhousie, the then Governor- General. Eden Gardens is now the home of Calcutta Cricket Ground.